If you&#39;ve been holding out for a white Xbox One, then you&#39;ll be able to get one this fall. If you've been holding out for a white Xbox One, then you'll be able to get one this fall. 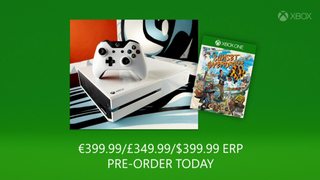 Just announced at Gamescom, a Sunset Overdrive bundle will be the first chance the general public gets to own a frosty version of Microsoft's newest home console. This White Xbox One Sure Is Snazzy. Too Bad It&apos;s Only For Employees.